On the first morning, we didn’t know where to eat except scouting around the hotel we stayed. Though I had checked with the hotel receptionist and a newsstand owner, we still went on our way. But our plan was hampered by rain. Here is a tip. If you want to save some bucks, try getting umbrellas from a newsstand instead of shops like Watson’s. Instead of paying $68 for an umbrella, we only paid $20. While walking, we saw a char chan teng (café in Cantonese) and since we wanted to try their local breakfast, we stepped in. We ordered porridge, wanton mee, yau char kwai, fried noodles, lemon tea, and nai cha (Hong Kong style milk tea). Total bill was $50++. As you probably notice, the cost of living in Hong Kong is relatively high. After the breakfast, we headed to Central by MTR train. I must say that I am totally impressed with Hong Kong’s extensive MTR lines. You can survive without a car in Hong Kong with MTR. 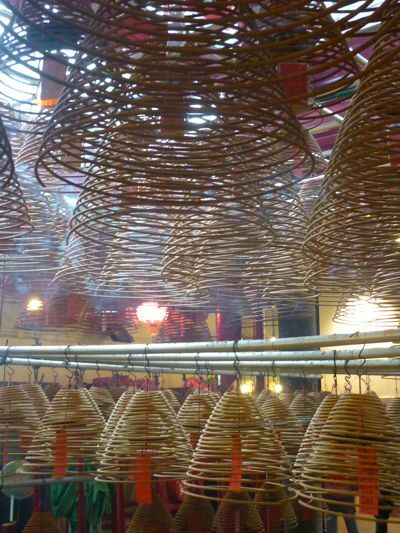 Our initial plan was to have a walkabout tour in Central including SoHo and Lan Kwai Fong. 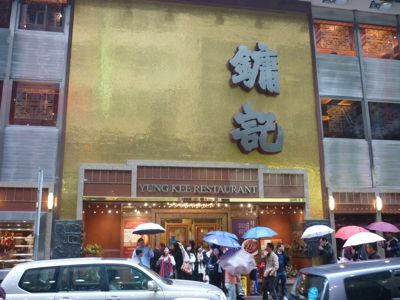 Central is the financial district of Hong Kong and it is also the place where one can find good local food. Since it was raining, it was quite cumbersome to walk around on foot. To make things worse, J and K were impatient and started to grumble after a short walk. 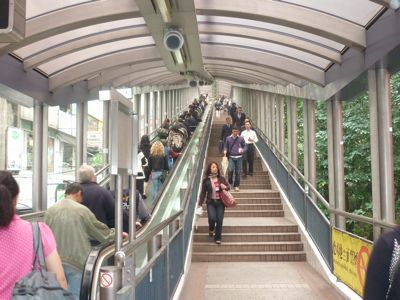 We only managed to get on the world’s longest outdoor escalator: Mid-Levels Escalators. We didn’t take the complete walk on the escalator. 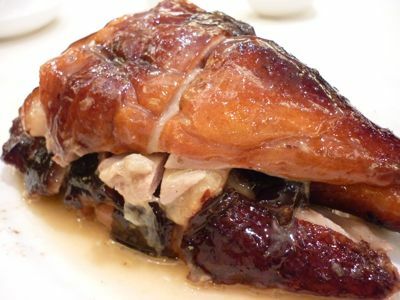 We exited Wellington Street to look for the famous roast goose in Hong Kong for lunch. Before we got a seat, we waited for 40 minutes at the restaurant. That’s how packed Yung Kee Restaurant was. We ordered only a regular size roast goose ($140). Later we realized we needed more input, we ordered a regular plate of char siew (BBQ pork). Plain rice in Hong Kong seems to be more expensive than Malaysia. I can’t remember how much but it is many times higher than we pay back home. After lunch, we walked to Lyndhurst Terrace for the famous egg tarts. 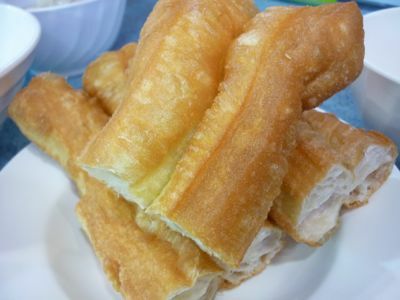 Tai Cheong Bakery is not a big shop and it is not far from Yung Kee Restaurant. 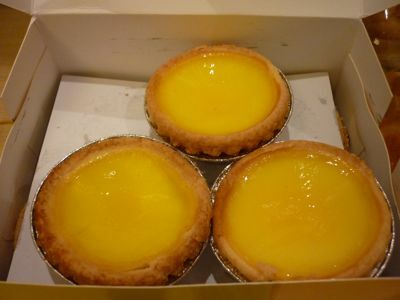 Besides the fresh, teeth-sinking egg tarts ($4 each), we also bought some boh loh pau (pineapple bun) which is a common snack for Hong Kong people. 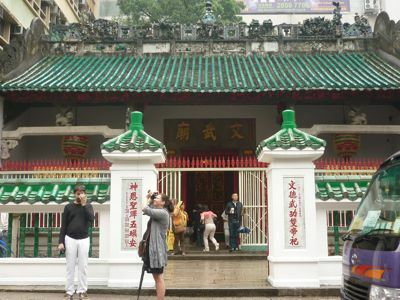 Next we walked along Hollywood Road to look for Man Mo Temple. The temple is dwarfed by tall buildings surrounding it. The temple was built in 1848. Man Mo signifies two gods: literature and war. After checking out the temple, we walked to Sheung Wan station to catch a train back to our hotel. The hotel is less than a minute’s walk from Tsim Sha Tsui exit.